1 March 2017, 5:36 PM. Hey, guys! It’s been about two weeks since I last posted one of these, and since nothing’s posted since, I figured I should post something new. Quick personal life catch-up: I’m officially a state licensed librarian. The process really wasn’t all that arduous – fill out a form, write a check, provide college transcripts and ID – and done. Still, it’s something to add to the resume. And speaking of which, the job hunt is starting to yield results – I’ve got an interview scheduled for a position, and I’m hoping it’ll work out. But let’s get on to what I’m going to recommend for you all today. It’s another comic book, though in a different vein than the previous one. 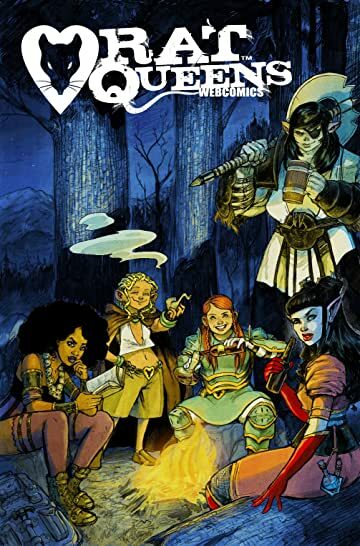 Sit back, relax, and let me tell you about Rat Queens by Kurtis J. Wiebe. 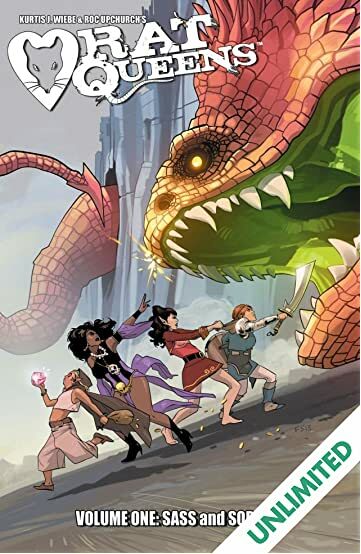 Rat Queens is a fantasy/comedy series that follows the adventures of what basically amounts to a standard D&D party – there’s a wizard, a fighter, a cleric, and a thief. What makes it fun and interesting is that the series actually looks at what a world where going out and killing monsters for money is a viable career choice might actually be like. 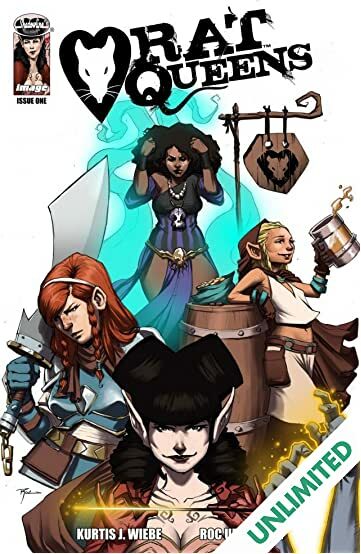 On the surface, it looks like the only thing that makes Rat Queens interesting is the all-female main cast, but that’s not really true. Each of the characters is interesting in their own way; they have backgrounds and histories that come into play. Even Betty, who’s probably the main comic relief character, is more than just a knock-off Halfling thief. This series has been going for a while now; the first issue was published back in September of 2013, and there are currently three collected volumes of about five issues each. As you can probably guess, there’s been a bit of schedule-slip due to difficulty retaining an artist: the first was taken off for reasons I won’t go into here, save to say that his being dropped makes sense; the second left for health reasons; the third left for one of two possible reasons, depending on who you believe – either there were some creative issues (the writer’s stance), or the writer was angling to bring back the original artist (the artist’s claim). Since the series is now on its fourth artist, I’m inclined to believe the former. 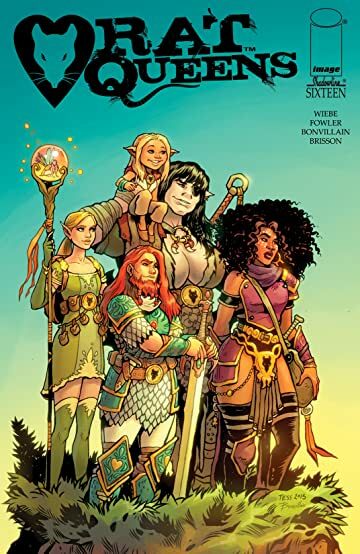 And speaking of which, we come to the reason that prompted this recommendation in the first place – Rat Queens has finally started publishing again, after an almost year-long hiatus. 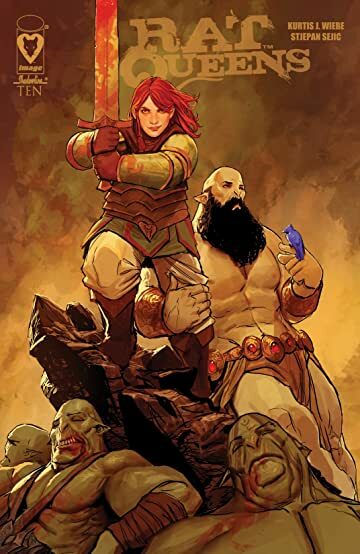 A new Rat Queens #1 was just released, so now is a great time to get started. Unfortunately, given the contents of the latest issue, it looks like whatever the plot arc that started in the previous issue (#16) has been dropped. It’s doubly unfortunate because that’s also the issue where the adventuring band Vox Mochina (of Geek & Sundry’s series Critical Role) made a guest appearance. But still, it’s good to see that this series hasn’t been dropped. There’s also two more issues already scheduled for release, so we’ll get at least three issues of the new series. Honestly, I’m really glad this series is back. Oh hey I saw this in the bookstore the other week and considered picking it up. With all the work I have for grad school, comic books are pretty much the only books I have time to read for fun. Also glad to see the job hunt’s working out! Interesting about the artist. I wonder — did each artist make an effort to keep the character designs and style similar to the one before them, or did they kind of do their own thing? You can still tell which character is which, but you wouldn’t confuse the work of one artist for that of another.